Strongwilled, excitable and opinionated - today's kids know just what they want so to simplify choice for kids and their parents alike, Resene presents KidzColour - a range of hues and metallics designed for kids of all ages. Colour options have been tested with various aged kids giving a range focused on bright bold, full chroma hues and metallics - perfect as a statement by themselves or combined with another equally bold hue for an invigorating scheme. For those with a newborn in the house, KidzColour also includes a smaller palette of soft pastels that may be mixed and matched with each other or used as a base for one of the brighter accent colours. Be the envy of all your friends and get coloured with KidzColour! Best of all, because it's just a coat of paint, you can add more colours or repaint when favourite colours change. The KidzColour range also includes favourite effects finishes such as Resene Magnetic Magic, Resene Blackboard Paint, Resene Pearl Shimmer.. Plus you can download stencil images from the Resene website and create stencilled masterpieces for just the cost of a different colour of paint. 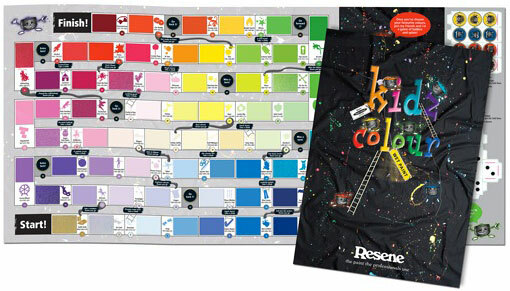 Check out the KidzColour swatches in the online colour library or get your copy of the KidzColour chart from Resene ColorShops and Resellers or order your copy online. Planet Fun have released a toy catalogue that includes examples of Resene KidzColours in use and a vast array of toys and accessories. View the Planet Fun play time catalogue. You will need Acrobat Reader. Think ahead... kids grow fast and tastes change rapidly. So make sure your plan incorporates options for the future. If you don't mind completely revamping the room in a few years, you can opt for a fully themed room... but be prepared to change it later! Latest trends and fads can be incorporated using cushions, posters, wallpaper borders and toys that can be easily changed as the trends and fads do. Check out what others have done to decorate kid's rooms in the online Resene Decorating inspiration Gallery, Littlies magazine decorating stories, OHbaby magazine decorating stories and Parenting magazine decorating stories and use their ideas as inspiration for your own. Kids tend to spend a lot of time playing on the floor, so opt for soft flooring where possible or ensure rugs have non-slip underlay. Avoid anything too light in colour as the occasional accident is bound to occur! Walls and doors will also be in for a workout so opt for a washable finish such as Resene SpaceCote Low Sheen waterborne enamel to make cleaning up marks easy. Check out Resene EzyPaint virtual painting software and try out your favourite colour scheme options without lifting a paintbrush. Available free online or borrow or buy a copy from any Resene ColorShop or Reseller. Resene EzyPaint is suitable for kids to use, provided you don't need the computer back for a while! Always try out the colour scheme you plan to use with Resene testpots just to make sure it's what you want before you start painting all the walls. Buy testpots online or at any Resene ColorShop. And parents, remember kids have firm favourites when it comes to colours - don't be afraid to let them go with their favourites - you may just be surprised how much you like the finish! Don't forget, there are lots of great effects you can create using effects finishes, stamps, sponges and general arts and crafts activities to add wall art, pencil holders and more to the finished room, so let your imagination run wild. Check out our tips on some of the finishes you may like to try out for yourself to get you started. 1. Find or make the stencil you want to use. Stencil pictures can be downloaded from this website, traced onto light cardboard and cut out to get you started. Tape the stencil to the wall using low tack masking tape. 2. Once you've got your stencil, dip your brush into your chosen paint colour. Dab the brush on a paper towel to get rid of any extra paint then place your brush at the edge of the stencil opening and apply the paint by dabbing the surface lightly or moving the brush in a circular motion. 3. Repeat step two until you get the colour intensity you desire. Check out the Resene stencil library online. 2. Get a small roller, moisten it with water and squeeze it between paper towels to dry the excess water off leaving a very slightly damp roller. 3. Put a small amount of the paint colour you plan to use on a paper plate or in a flat bottomed low-sided container. Roll the roller through the paint and then onto a clean part of the plate or container (or use a separate sheet of paper) to ensure the paint is distributed evenly on the roller. Roll back and forwards across the cut-out area of the stencil. Make sure you roll in several different directions to get the best coverage. Check out the Resene stencil library online. Clouds can be a very relaxing finish to any room, making it seem airy and giving something to look at when stuck in bed during the day. To create a cloudy sky, apply a base colour of blue to the full ceiling area and allow to dry. Then use a sponge to lightly apply the white clouds. Dip the sponge in the white paint, then dab onto paper to remove excess paint before applying the sponge to the ceiling. Just add a few clouds at the start and allow to dry - you can always add more clouds later, but it will be much harder to take them away! Stripes can be a neat effect for a room, allowing you to use two (or even more) favourite colours all over the room. Paint one colour over the complete area where you wish to create stripes and allow to dry. To create stripes, place low tack masking tape along the edge where you want the stripe to go. Make sure the tape is well pushed down on the edges otherwise the paint will creep underneath it. The best idea is to buy tape that is the same width as the stripes you want to create, as this will make your job easier. Apply as many pieces of tape as you want to create stripes. Paint the second colour over the exposed area and onto the taped area. Carefully remove the tape before the paint dries. If you wish to paint wider stripes and can't find wide enough tape, simply place tape down either side of the area where you wish to create stripes and then paint between the two pieces of tape and just slightly onto the taped area. Be careful not to paint beyond the tape. Carefully remove the tape before the paint dries. Download this Resene KidzColour moneybox template, paint or colour it in then assemble. Create a row of house moneyboxes - fun to play with and save in. Keep little hands busy with Resene arts and crafts activities for children. Create pet rocks, personalised covers, colourful wrapping paper and more. 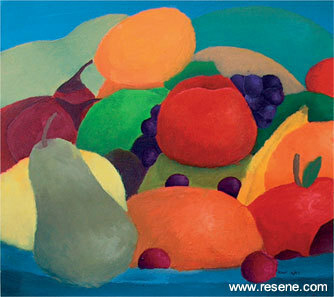 Try out the Resene Art Action art & poster, student acrylic and tempera paint range, ideal for kids of all ages. Available in a range of colours. Try out Resene EzyPaint virtual painting or download your favourite testpot character free. Get testpots of your favourite colours and use them to paint your favourite testpot characters - if you make a mistake you can always print out a new page and start again! Have fun creating your own colour on any computer - simply visit the create colour section - adjust the slider to select a basic colour and then click on the big square to see a swatch of that colour. You can create your very own colour, print it out on a colour printer and take it into any Resene ColorShop or Reseller for colour matching. Learn about the hazards involved in redecorating, including the risks of lead-based paint and solvent odours ad how you can minimise these risks when undertaking your next project - see the Resene low odour eco-friendly way to paint a child's bedroom brochure. RoadSense has worked with Resene to develop Steps to success with footprint stencils and ideas to keep our children safe.